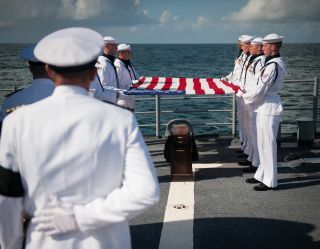 Members of the US Navy ceremonial guard hold an American flag over the cremains of Neil Armstrong, Apollo 11 commander and the first person to walk on the moon, during a burial at sea service aboard the USS Philippine Sea (CG 58), Friday, Sept. 14, 2012, in the Atlantic Ocean. Armstrong died on Aug. 25 at age 82. The iconic astronaut Neil Armstrong, the first person to set foot on the moon, was buried at sea today (Sept. 14). The ashes of the former Navy pilot and Apollo 11 moonwalker, who died Aug. 25 following complications from heart surgery, were committed to the Atlantic Ocean during a ceremony aboard the guided missile cruiser USS Philippine Sea. The exact location of the service was not immediately available, though the USS Philippine Sea shipped out from Mayport, Fla., with Armstrong's family aboard. President Barack Obama had ordered flags around the nation to fly at half-mast today, to honor Armstrong and mark his ocean interment. Armstrong's burial at sea came a day after America paid its respects to Armstrong during a public memorial service at Washington National Cathedral in Washington, D.C. Family and friends had held a private ceremony for the moonwalker in Cincinnati on Aug. 31. US Navy Lieutenant Commander Paul Nagy, USS Philippine Sea, and Carol Armstrong, wife of Neil Armstrong, commit the cremains of Neil Armstrong to sea during a burial at sea service held onboard the USS Philippine Sea (CG 58), Friday, Sept. 14, 2012, in the Atlantic Ocean. Armstrong, the first man to walk on the moon during the 1969 Apollo 11 mission, died Saturday, Aug. 25. He was 82. Armstrong became an international icon on July 20, 1969, when his boot crunched down into the gray lunar dirt. The words Armstrong uttered upon the occasion — "That's one small step for [a] man, one giant leap for mankind" — are among the most famous ever spoken. Armstrong and fellow Apollo 11 crewmate Buzz Aldrin spent more than 21 hours on the moon during the mission, while Michael Collins orbited above them in the command module Columbia. On July 24, 1969, all three men returned safely to Earth, making good on a pledge President John F. Kennedy had made eight years earlier and notching a huge win in the Cold War space race against the Soviet Union. Neil Armstrong, who was 82, served as a Navy pilot from 1949 to 1952, and he flew 78 combat missions in the Korean War, according to NASA officials. The USS Philippine Sea is an active-duty Navy vessel named after the Battle of the Philippine Sea, which the United States and Japan fought from June 19-20, 1944, off the Mariana Islands. The ship was commissioned in March 1989.